Some military officers in the Ghana Armed Forces are unhappy with what they say is the Military High Command’s decision to delay their promotions. 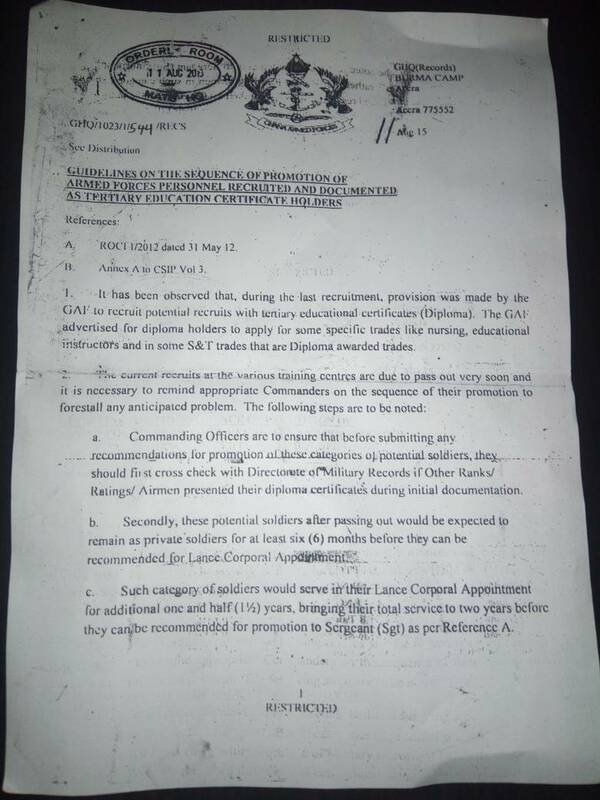 According to a restricted internal military memo sighted by Citi News, these officers were due to be elevated to the rank of Sergeant after serving for two years, but were only promoted to be Corporals. “Such category of soldiers would serve in their Lance Corporal Appointment for additional one and half (1 1/2) years, bringing their total service to two years before they can be recommended for promotion to Sergeant (Sgt) as per Reference A,” the memo said. Meanwhile, Citi News checks revealed that the policy on their promotion has been suspended and is currently being reviewed for appropriate recommendations to be made.